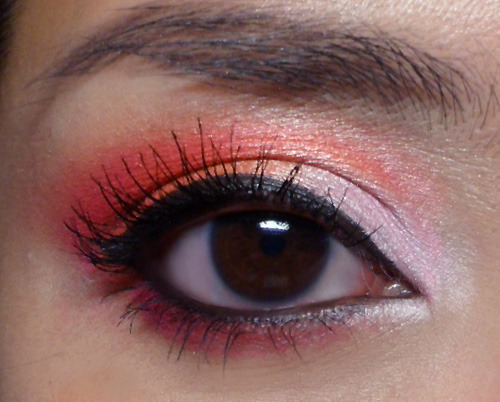 Orange and coral is not a shade most people will want to wear on their eyes, but when you pair it with a pastel amd a deeper fuchsia it just looks so tropical, fresh and fun. Step 1: Pack the pale pink in the inner third of the lids. Step 2: Apply a bright range down the center of the lids, and then curve inwards along the socket line to hug the pale pink and define your eye contours. Step 3: Apply a deeper coral-orange in the outer parts of the lids and then run inwards along the socket line, above the bright orange applied earlier. 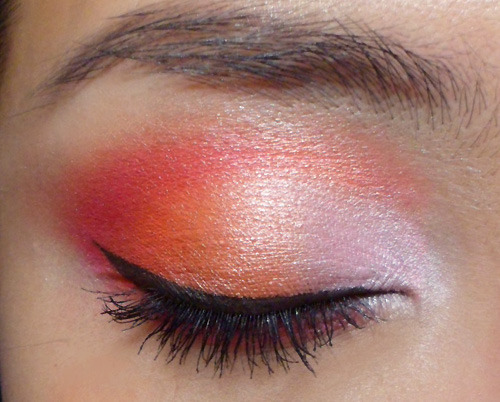 Step 5: Run the magenta along the outer halves of the lower lash line as well, to tie the colors together. Step 6: Use a black gel liner and run it along the upper lash line, as long as along the water line, ending it in a slight flick.